I was already at the point of, “Alright, this isn’t going to happen,” when I got the message back from my dress maker. I had met with her back in the beginning of March and after a few weeks texting pictures back and forth we had solidified prices and fabric for what was going to be my amazing formal dress. I gave her a sheepish look and said, “None…” Dragging the end of the word out, anxious to see how she would take that statement. I eagerly jumped headfirst into describing “the perfect for Katie Schrock” gown to her. My older sister had already done up a fashion sketch so getting the final idea approved by both my National Director and modified by the designer were the last few steps. About two weeks from my coronation I hadn’t gotten the slip that I was supposed to have fitted for the final pattern of the dress nor had I been summoned for a final fitting. Hmmm….. I started sending her texts but had no replies. I realized that I probably wouldn’t have the dress by the time my coronation rolled around and began making other plans. A few days before the coronation I got a message from the dress designer, absolutely stressed and feeling horrible! She is very trustworthy, she made all of my sisters gowns as well as many other Miss Rodeo Oregon gowns and wedding dresses, so I had absolute faith that there had been a miscommunication. I was most definitely right about that! With how absolutely adamant I was about CMA Red Carpet fashion it didn’t really come as a surprise when she first apologized for leaving her phone behind when her husband and her went to work on their rental house in Nevada but that she had thought the dress was FOR the CMA Awards! It totally made sense, that’s literally what I kept saying! Then it was on to the next step: Find something to wear! I have a REALLY hard time being the center of attention, like a REALLY HARD TIME. My life coach Ashley, who was also my emcee for the event, told me that I needed to make sure that I wore something that was just so stunning that I wouldn’t be able to stop smiling, that I would feel ABSOLUTELY GORGEOUS in and then everything would be okay. I don’t know about you but HOW IN THE WORLD do you make a FORMAL RODEO QUEEN CORONATION outfit out of a lace crop top?! I didn’t see the dress that I wore for coronation until I was in the room changing from outfit #1 to my coronation dress. The dress that I ended up wearing was Ashley Minaise’s Miss Oregon formal wear dress, a black strapless, sequined, GORGEOUS gown! 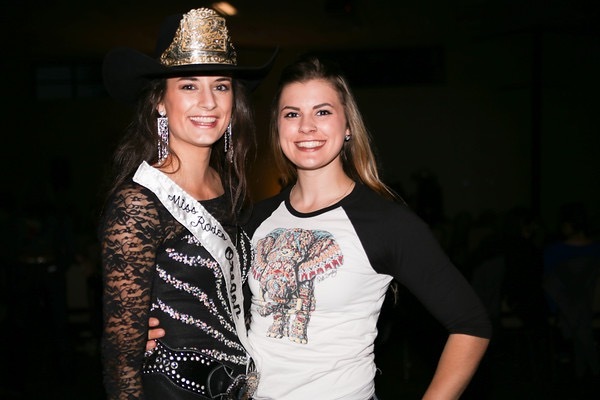 I wore my lace crop top underneath to give it the formal full length that is required as a rodeo queen and I added on some beautiful earrings given to my sister Nicole by the 2012 Miss Rodeo Oregon Shelby Ross as well as my sequined Bodacious Boots and I was good to go. I got so many compliments on the dress! It absolutely blows my mind! To think that I literally threw it together last second (and the fact that I actually fit into it because Ashley was TINY when she was Miss Oregon-USA) and it looked that amazing! I felt so AMAZING in that outfit! I cannot wait to share my other dress with all of you as well… and if anyone has a ticket for the CMA Awards or any other Country Music Award Show, I most definitely have two dresses that I could wear to it now! The dress is absolutely beautiful on you. Although I personally wrote how I wear leather (http://katiesurritt.wix.com/katieredefined#!Why-Rodeo-Queens-Need-Cow-Sense/cgla/57200f090cf269c350f0e841), I couldn’t imagine you in anything but high fashion of the red carpet. 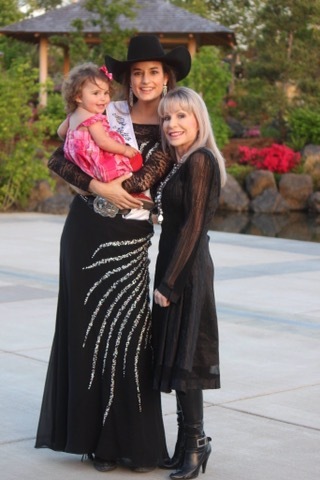 A beautiful dress to match a beautiful Miss Rodeo Oregon!